© By Linda J. Brodzik, Dog Trainer & Behavior SpecialistOh, the games puppies and adult dogs play, by themselves, with each other and with us! Wrestling, tugging, chasing, stalking and stealing items away from their opponent, it’s all just fun and games. Or is it? The truth is, all that fun and frolic actually has a purpose. By understanding this purpose we can successfully use play to benefit our relationship with our dogs and enhance their mental, emotional and physical health. Play expends energy and dogs are natural explorers. They are curious and intelligent problem-solvers. They seek stimulation and puzzles to investigate and conquer. They not only enjoy playing but need to do so. Dogs need continual and diverse opportunities to exercise both their bodies and minds. 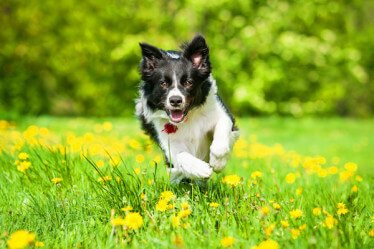 Needs may vary among individuals, but on average, a dog should receive between two and three hours of a combination of mental and physical stimulation per day. This may sound like a lot and seem like an impossible task, but given the consequences of the lack of adequate exercise and stimulation, it is necessary. Dogs that have the opportunity to play and exercise are generally happier, more emotionally stable and calmer than those who do not. Play allows an appropriate outlet for energy that would otherwise go elsewhere. If we do not initiate appropriate ways for our dogs to play and exercise, rest assured they will find their own. Often, bad behaviors such as chewing, digging, stealing, jumping, anxiety and even aggression stem from the buildup of excessive mental and physical energy that lack an appropriate outlet. It is unrealistic to adopt a dog into our homes and expect them to lie about the house all day without stimulation. Just like us, they need a purpose, a job to do. Mental stimulation is just as important as – if not more than – physical exercise. Problem-solving games can wear off far more energy in a shorter time period than physical exercise alone. For many dog breeds that were developed to herd, guard, or hunt, problem-solving opportunities are a necessity for their active minds. Play also contributes to the setting of boundaries. All games have rules. 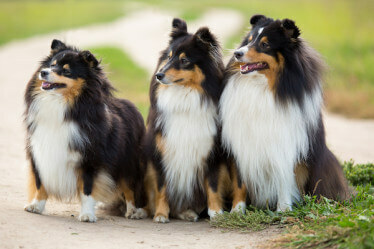 When dogs play with other dogs, they set very definite rules as to how the game is played and what is out of bounds. When people play with each other we do the same. But often, when people and dogs come together in play, we forget to set rules and guidelines as to how the game is played. If we do not set these rules be assured our dogs will. Often their rules include behaviors we do not like or want them to display, such as biting, jumping, running away, or seizing control of the play item. Play allows us an excellent and fun way to teach our dogs many important lessons. Approached skillfully, play can help set a positive leadership position and set appropriate boundaries. By establishing set rules and adhering to them, we can increase attention and a willing attitude to following our guidance. Play can also teach our dogs a greater ability to self-calm and self-control during periods of increased excitement and stimulation. Play can also be used to build on a quicker and more accurate response to obedience behaviors such as come, sit, down, stay and heel. In addition, play allows us the opportunity to teach new and advanced behaviors such as directed retrieving, scent discrimination, directed jumping (over obstacles) and tricks. When else do we have such undivided attention as when we are playing with our dogs, or such a powerful reinforcement? This offers us an exceptional opportunity to use play as reinforcement for appropriate behaviors learned in an informal and inviting setting. Dogs often offer lessons that they have learned through play more freely as they associate these behaviors with fun and a trust in our intentions towards them. This is a powerful teaching opportunity never to be abused. If we should become angry or over-controlling during play sessions with our dogs, they can learn to distrust us, our intent towards them, and our communication. This could lead to an overall breakdown of our ability to guide them and teach them in the future. Play should be joyful and nurturing. It should be guided by a trust that bonds us closer with our dogs. It is the heart and soul of our ability to communicate with, and understand, each other. Lessons that are taught through play transfer into other daily interactions. If our dog controls the game (i.e. when it starts, when it ends, and the rules of play) we can be assured he/she will attempt this same control in other aspects of our relationship. 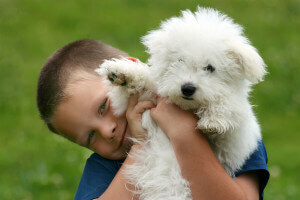 Play is a very important interaction for our dog’s mental, emotional and physical well being. But it is equally important to our relationship with them. We should approach play as an opportunity to teach and guide our dog’s attention and behavior. Above all we must always approach play as a joyful interaction that bonds us. Dogs can play by themselves, with each other, or with us. Playing by themselves can include chewing on an owner-approved bone, trying to figure out an interactive toy, or amusing themselves in a self-involved game. The ability to self-occupy allows our dogs a greater opportunity to expend energy, while being allowed more freedom in the home and social time with us. There are many good and safe toys on the market, but not all toys are appropriate for all dogs. When giving toys, be sure that your dog is not likely to destroy and/or ingest it. Also be sure that bones and raw hide are large enough to prevent your dog from swallowing them. 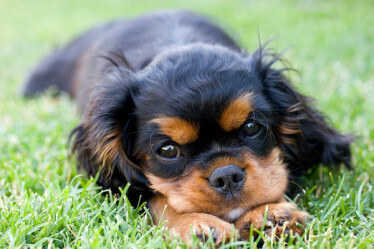 Play with other dogs allows your pet the opportunity to be comfortable with other canines. 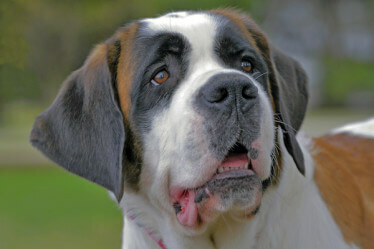 Dogs who have not learned, or are not allowed, to play with other dogs are denied the opportunity to learn successful communication with their own species. Dogs who regularly play with other dogs display fewer problems related to fear and/or aggression directed toward other dogs. Many communities have dog parks where dogs can meet and play. Only social dogs should be taken there, however. Those displaying aggression or anxiety concerns should be seen by a qualified behavior and training professional before engaging in such activities. You can find out more about dog parks in your community by doing a Google search for them in your area. Dogs need something to do. Toys provide essential occupational therapy to both puppies and adult dogs. Playing with them allows for a safe and appropriate outlet for curious, explorative and stressful energies that may otherwise be expended in less appropriate ways. If we do not give them something fun and interesting to satisfy their active minds, they will inevitably find their own “toys” to play with, like your designer shoes left lying on floor or the imported leather sofa. When in need, dogs can turn just about anything into a play toy. By supplying our dogs with safe and interesting toys we can avoid problems like the theft and chewing of inappropriate items. Perhaps more importantly, the lack of sufficient stimulation can also contribute to other problems such as barking, unruliness, anxiety and even aggression. Walk into any pet store and you will be presented with an overwhelming variety of toys from which to choose: fleece toys, squeak toys, rubber toys, toys that make noise and toys that hide food treats. With so many from which to choose it’s hard to know which ones to buy. There are some great toys on the market, but remember, not all are appropriate for every dog. Fleece or stuffed cloth toys might be great for some dogs but others will destroy and disembowel them within a matter of minutes, which can cause a health concern if parts are ingested. The same is so for latex squeaky toys. Many dogs enjoy chewing on them, or chasing them about the house, but if your dog is prone to destroying toys these might not be a good choice. Rope toys and “Booda Bones” should be bought with the same caution as cloth and latex toys. In the jaws of an active and destructive chewer, they, too, can be dangerous if ingested. For the active chewer, there are several hardy rubber, plastic and hard nylon toys available to supply safe and fun pacifying activity. The “Kong” company makes a number of great toys that are not only problem-solving oriented but also safe for the dog that plays hard. In my opinion, every dog should own an original Kong toy. It’s a heavy rubber toy that is snowman-shaped and hollow inside. They come in several sizes, but I always suggest a larger size for most dogs. The idea is stuffing the toy with food treats like biscuits, peanut butter or any other food items your dog likes. Your dog then has to lick and chew at the toy in order to get the food to come out. Try making “Kongsickles,” a tasty treat dogs love. Turn the toy upside down so that the small hole is on the bottom and the larger hole is on top. Plug the little hole with cheese or peanut butter so that the Kong will now hold water. Fill the Kong with your dog’s dry food, pour a salt-free bouillon or gravy water in the Kong and then place it in the freezer to harden. In a few hours you’ll have an interesting and interactive pacifier to feed, occupy and stimulate your dog. This is a great way to feed your dog his/her daily meals. The Kong Company makes two other toys that I think are essential. The first one is the “Planet Kong,” a heavy rubber toy that is shaped like the planet Saturn. It has three star-shaped holes that go through it from top to bottom. If you layer small pieces of food treats into the holes (such as cheese, dog food, or biscuits) your dog will be enticed to lick and chew to free the tasty little morsels. I have watched dogs play with this toy for up to an hour working feverishly to get every last treat out. The other Kong toy that every dog should have is the “Havaball.” This hexagonal-shaped hard rubber ball is hollow inside and has thin slats running along the sides. The idea is to put your dog’s food inside the ball and place pieces of the food into the slats. Your dog will roll the ball on the floor freeing the contents bit by bit. He/she will also have to chew at the toy to free the pieces that have been lodged into the slats along the side. What a fun way to have our dogs “hunt” for their meal! Another great food time toy is called the “Buster Cube”. This is a heavy-duty plastic box that has rounded corners that allow it to tumble like a dice. Through a tube on one side you can put your dog’s food into the cube. Your dog then has to tumble the toy on the floor (or in your yard) to get the food to come out. This is another great “hunting” toy that offers a wonderful opportunity to mentally stimulate your dog while engaging in a very natural canine behavior. By feeding your dog his/her meals through play toys you can easily increase your dog’s mental and physical stimulation with little effort and personal interaction. Another essential toy for the active chewer is the Nylabone. This is a hard bone-shaped nylon toy that is safe for active chewing. These come in many sizes, but buy one that is appropriate to your dog’s size and chewing activity. When in doubt, buy a larger rather than smaller one. If you have a destructive chewer, you might consider the Galileo Nylabone. This is a larger odd-shaped toy that is, in my experience, virtually indestructible. Some dogs will naturally take to chewing the Nylabone toys, but others need a bit of encouragement. To help increase interest you can soak the toy in bouillon, or put it in a baggie containing meat scraps. If you leave it in the refrigerator overnight it will be an enticing treat by morning. There are other natural toys available. Real bones, rawhide, pigs’ ears, and cow hooves and knuckle joints can be a tasty treat for dogs. But they can also be dangerous in the jaws of the wrong dog. Although some dogs will chew rawhide into small digestible bits, others may ingest it whole, causing a blockage in the intestinal tract. Some natural bones are hard and very difficult to splinter. But others crack easily and if ingested can perforate the intestinal wall. Pigs’ ears are generally safe but last only minutes with most dogs. Cow hooves can supply a great outlet for chewing activity but can give off an unpleasant odor when wet. 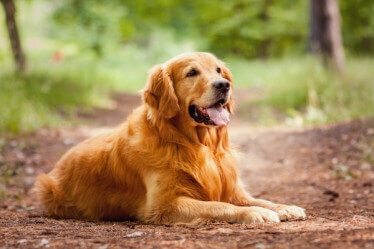 When giving your dog these natural items it is best to supervise the activity. It should be noted that some dogs might become possessive of “food type” toy items. These toys should not be given to dogs that display aggressive or guarding behaviors. Toys can be quite reinforcing in themselves. But we can help increase our dog’s interest in them by offering praise and attention when they are actively engaged in play with the item. By giving our dogs attention when they are playing appropriately, we strengthen their desire to seek out and interact with desirable play items. They will soon equate chewing on the appropriate item with gaining your attention and approval. With so many stimulating toys available it is not necessary to give our dogs inappropriate and often dangerous items such as old shoes, socks or other human items to use as toys. Allowing your dog to have these items only adds to his/her confusion as to what may or may not be appropriate to chew. Remember, your dog can not tell the difference between your old, worn-out shoe and your new $200 pair of Guccis! Although interactive play with other dogs is important, it should never take the place of interactive play with human owners. Interactive games with us might include fetch, hide-and-seek, agility, fly ball or Rally–O. These games offer an excellent opportunity for the release of physical energy as well as a great way to build the communicative bond between you and your dog. I am not against games of tugging or wrestling, but I strongly believe that they should not be taught to, or played with, dogs who do not have a very good ability to self calm, self control, and set self boundaries, or do not pay keen and eager attention to their person’s cues and guidance. Interactive games with humans should always be initiated by us and guided by set and consistent rules. Biting, mouthing, body slamming or aggressive possessiveness of play items should not be allowed in any game. Also, games in which you chase your dog should be avoided unless you already have a reliable recall (i.e. “come”)! 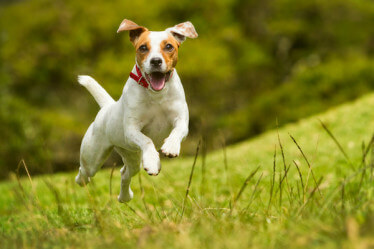 Chasing your dog only reinforces that they are in control and you must follow. 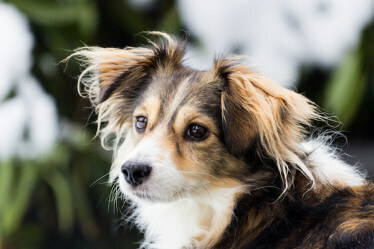 Trick dog training is an excellent way to exercise your dog’s mind. Trick training can teach creativity and problem-solving along with instilling stronger attention to you and your guidance. In addition, it gives your dog new skills and abilities that you can use to give your pet jobs that release mental energy. It also teaches you, the trainer, greater instructive ability and communication skills. In my opinion, every dog and dog person should complete a well-structured trick class. Tracking and scent discrimination are also excellent ways to release mental (and physical) energy. 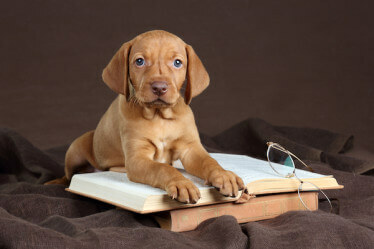 There are many good books on the subject and some local trainers offer classes in these areas of learning. Play can also be physical, mental or both. Fetching a ball, walking or chewing a bone is, for the most part, physical in nature and does little to offer mental challenge and stimulation. Interactive toys, games of hide-and-seek, or trick dog training, agility, flyball or tracking/scent discrimination offer our dogs an excellent opportunity for them to use their innate problem-solving skills and expend mental energy. Agility and tracking are excellent examples of games that necessitate use of both physical and mental energy at the same time. As in all other things in life, balance is the key. In order to successfully adapt to our homes, dogs must be taught how to appropriately and calmly occupy themselves. We must also make time to play interactively with them. 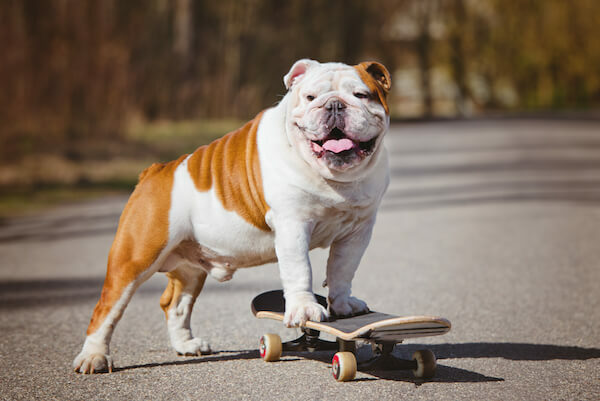 By balancing the use of problem-solving toys and interactive activities, we can offer our pets the mental and physical stimulation they crave and need. We must remember to offer diversity, not only in activity, but also through toys. 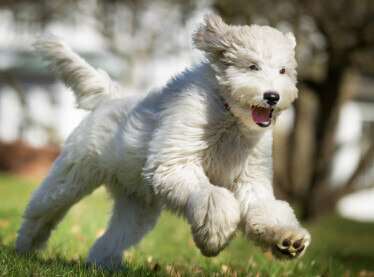 Remember, an exercised dog is a calmer, happier dog with a happy owner! To learn more about my training methods, ask about availability in a dog obedience class or to schedule an in-home, private behavior consultation, please contact me today.